Visit embassysuites.com/careers or jobs.hiltonworldwide.com to be entered into Embassy Suites careers page on which you'll be displayed three ways of finding a job at Embassy Suites - Do Quick Job Search by inputting keywords, job title or job id, city and state/province and then clicking "Search Jobs", Click "All Jobs At Embassy Suites" and Browse Featured Jobs at Embassy Suites by Hilton. 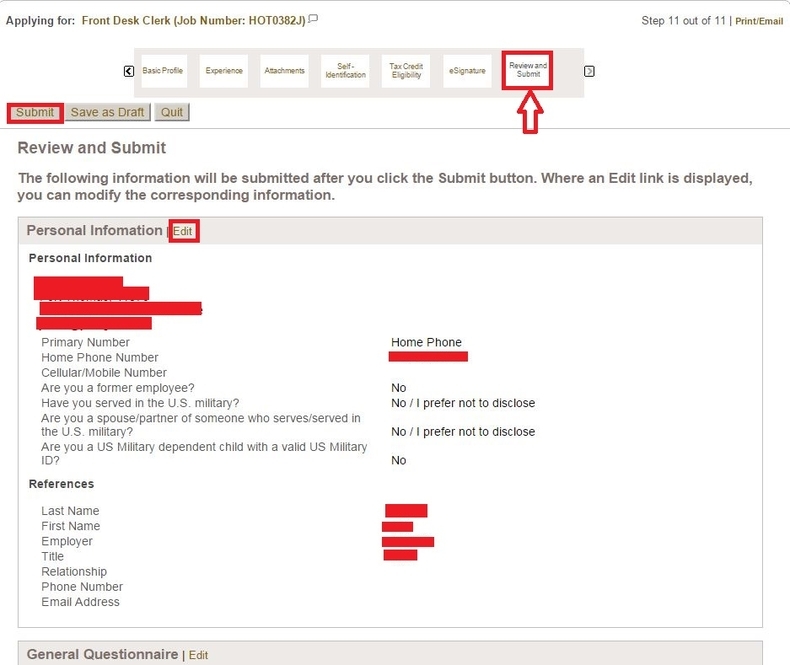 Here we just input a job title in the blank to go through the whole process of online application at Embassy Suites. On the page below displays 159 opportunities matching your search in the last step. You may browse the job titles listed in the results and pick up the one you're fond of and click it or use the refining criteria like employment type, job category and brands to help you fix one job title. 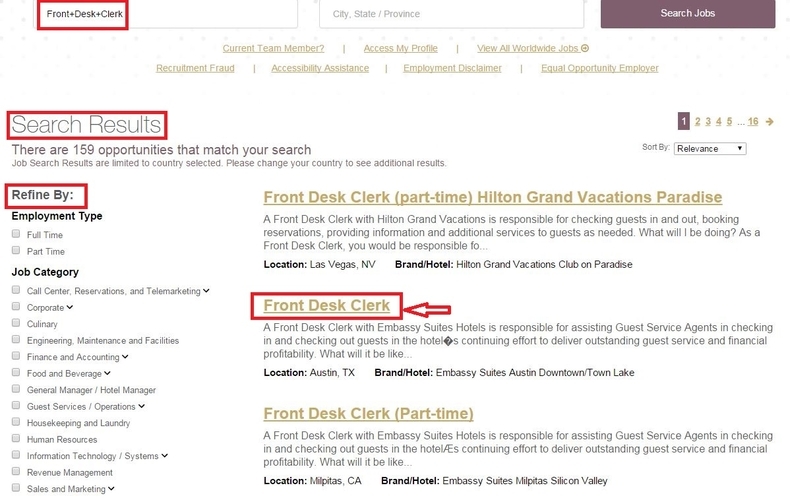 Here we just click the "Front Desk Clerk" in the search results to move on. 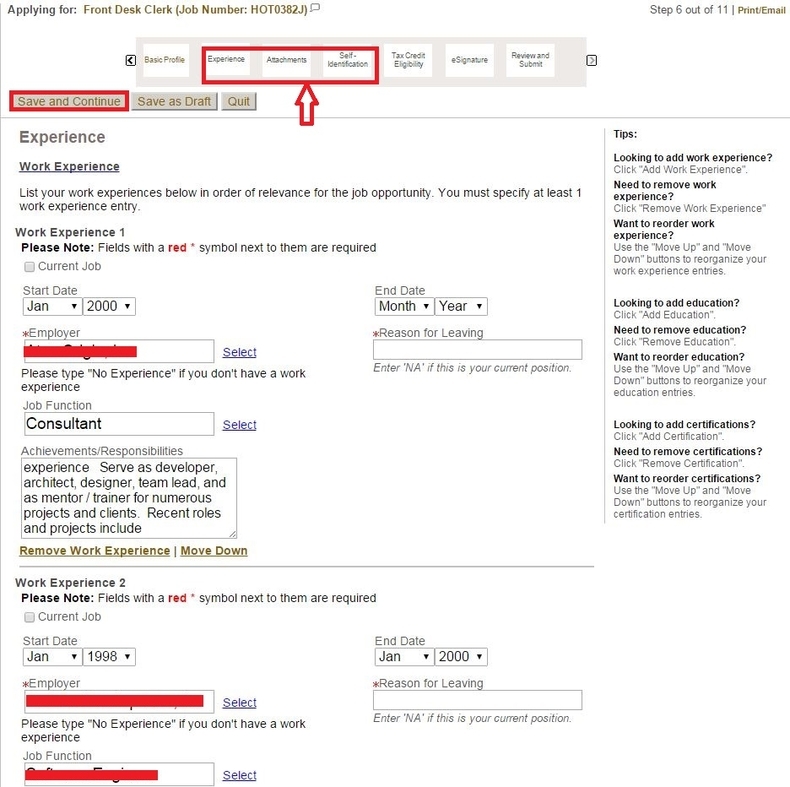 After you select the job title and click in the last step, you're led to the page on which presents you the job description including job requirements, benefits, etc.. You need to read the info carefully and click "Apply now" on the right side or bottom of the page if you're ok with all the conditions referred in the description. Submit your personal and professional information by uploading a resume or by uploading a profile through a third-party service. 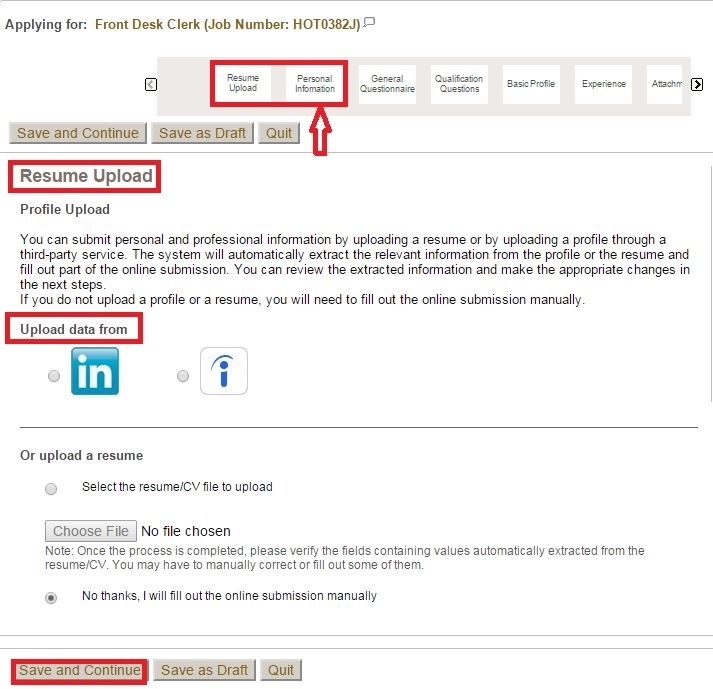 If you do not upload a profile or a resume, you will need to fill out the online submission manually. Afterwards, you need to enter all the relevant personal information including your name, address, phone number references, etc.. 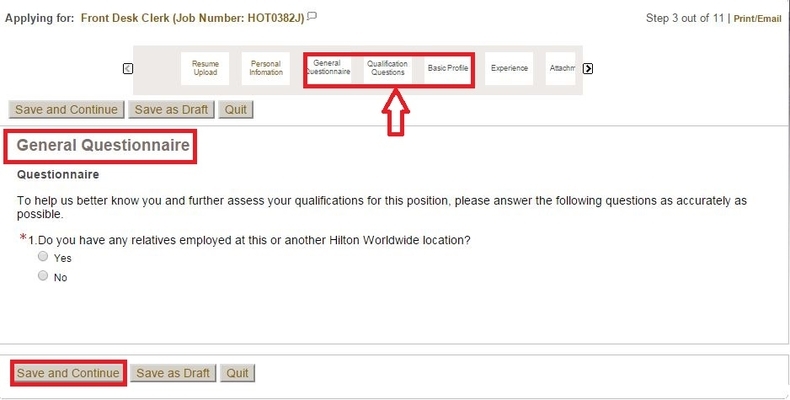 In this step, you need to do three things - Do a general questionnaire and answer some qualification questions to help the company better know you and further assess your qualifications for the position you are applying for and then indicate your employment preferences, conditions, and interests in each of the fields required. For assistance with selecting more than one interest, see Helpful Tips on the right side of the page. Step 7 asks you to list your work and educational experiences and valid and relevant certifications . You must specify at least 1 work experience and education entry. Afterwards, you can attach additional files to support your application like a cover letter, CV, references, and any other information that you think is relevant. Once you attach a file, you can easily overwrite it by attaching another file with exactly the same name and extension. 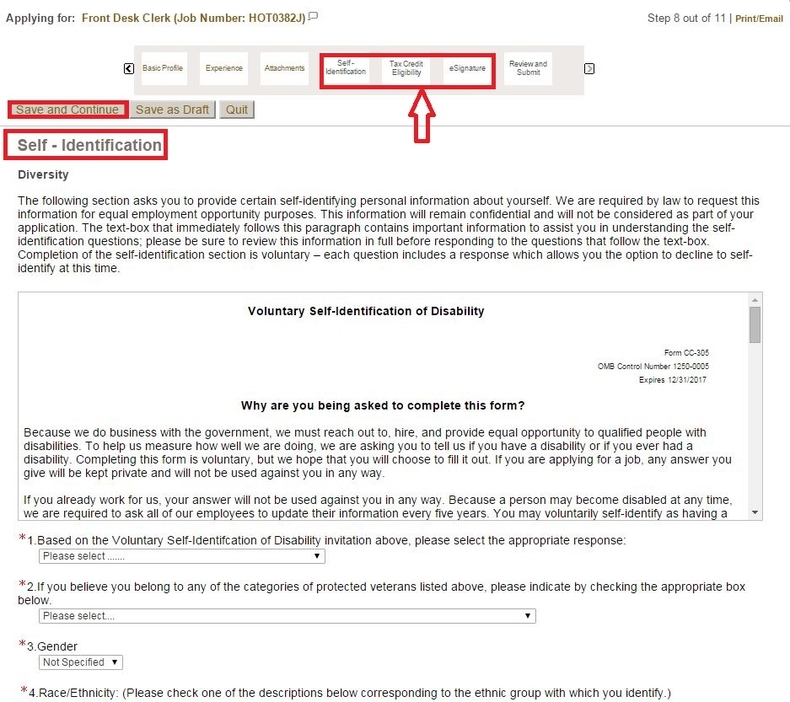 Read the Voluntary Self-Identification of Disability and Invitation to Applicants to Self-Identify as a Protected Veteran and then select your gender, race/ethnicity and indicate your disability status, veteran status by selecting the appropriate response. After you're done with the self-identification part, you'll be asked to finish the tax eligibility part by completing tax questionnaire as part of Work Opportunity Tax Credit (WOTC) program. After answering some questions in the survey, you could type your full name as your e-signature to signify your acceptance of the terms of the foregoing statement in the page of e-signature. Review and submit your application by clicking the Submit button. Where an Edit link is displayed, you can modify the corresponding information. 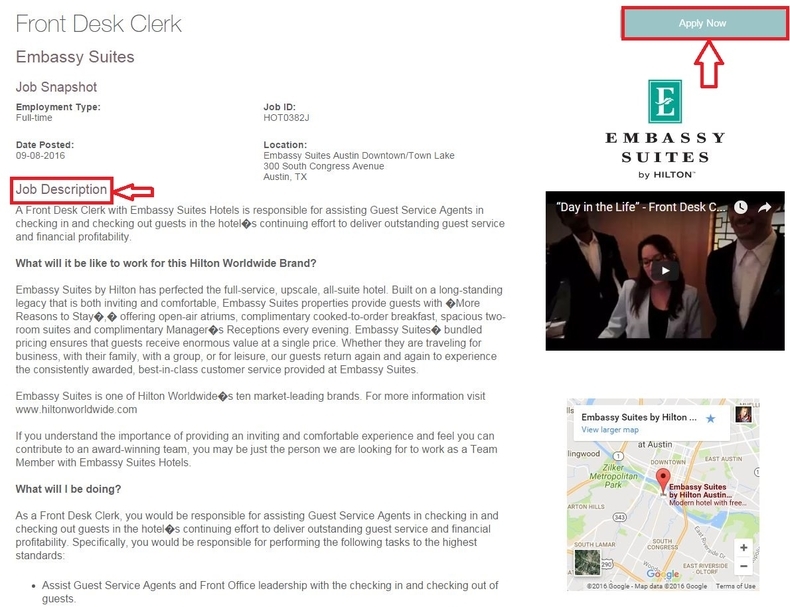 After 9 steps of efforts, you finally get to this page showing that you have just completed the online job opportunity experience with Embassy Suites. If your Candidate Profile matches the company's requirements, you may be contacted by a Human Resources Representative. 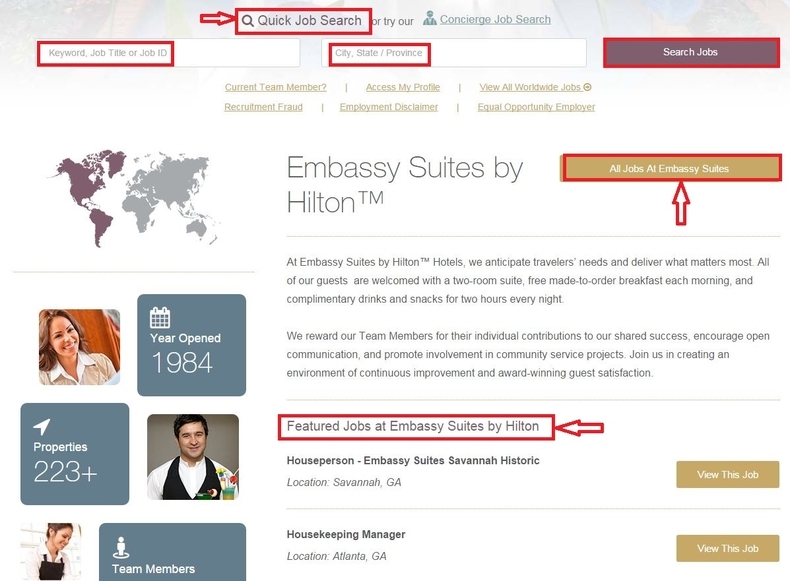 Click jobs.hiltonworldwide.com to apply for Embassy Suites jobs online.